For General-32,SC-08,ST-04 and OBC-16 Posts. out in Delhi High Court-l1.08.2015. Essential Qualification - BCA/B.Sc in Computer Science from any recognized university with minimum 50% marks. Mode of Selection : Selection shall be made on the basis of written test + interview.The short-listed candidates will be called for interview. 300/- for General and OBC candidates. Subject area-General Intelligence( A).General Awareness (c) Quantitative Aptitude (d) English (e) Computer Science.Written Test 85 marks and Interview 15 marks. 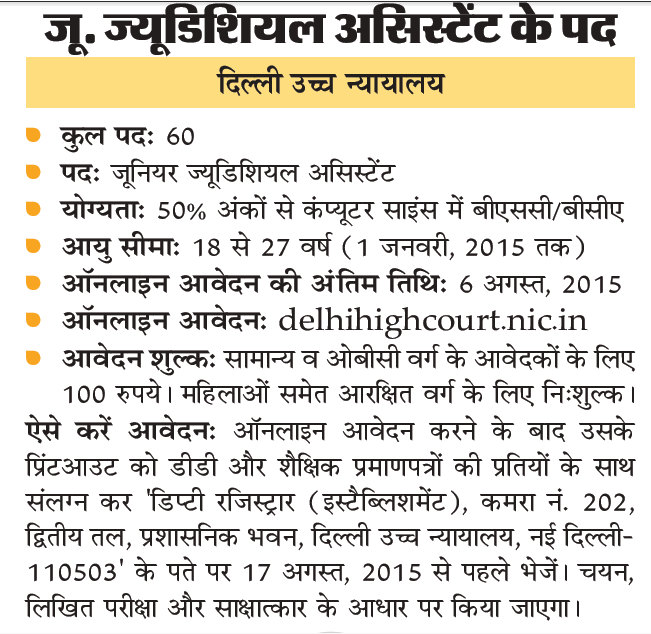 HOlY to Apply- Eligible candidates may apply online on the official website of this Court i.e. www.delhihighcourt.nic.in. Address for hard copy- Deputy Registrar (Establishment), Room No. 202, 2nd Floor, Administrative Block, Delhi High Court, New Delhi~110503"
Write on the top of the envelope “Application for the Post of Junior Judicial Assistant (Technical)”. The date of Interview will be announced later on the website.